On New Year's Eve, some may like to celebrate at parties and sing Auld Lang Syne. 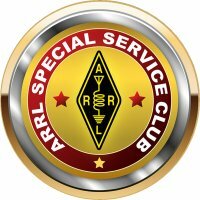 But Club members who enjoy tapping out Morse Code signals on an old fashioned straight key (and everyone who likes to watch) will enjoy visiting the Clubhouse Museum for the annual ARRL Straight Key Night. The W7OS Antique Radio Museum comes alive for Straight Key Night. It's sort of a contest, but no one keeps score. It starts officially at 0000 hours Greenwich Mean Time on the first day of the new year. Just have a nice chat with a station on the CW portion of the band, then give it another try. Slow speed and a rusty style are perfectly OK for SKN. In the museum, antique transmitters and receivers from the 1960's and 1950's (and earlier) are dusted off and brought back to life. Older hams try to remember how to tune the transmitter and zero-beat to make sure transmitter and receiver are on the same frequency. On this day, radio frequencies are expressed in "kilocycles" and "megacycles". The museum room upstairs in the Clubhouse grows warm with the glow of old vacuum tubes. Downstairs, members and their guests enjoy slices of gourmet pizza for supper and linger around a table overflowing with homemade cookies and other dessert treats. Folks are encouraged to bring along a favorite straight key, bug, or code practice oscillator for Morse code demonstrations in the classroom. Typically things get going mid-afternoon. The old timers tell us they need to get to bed early, so we usually shut off the power and turn the lights off around 9:00 PM. You will find pictures of some of our past SKN events in the Photo Gallery.